Meet your group and Tour Manager at the Pullman International Cairns Hotel. The rest of the day is spent at leisure. Today we travel on the wonderful 125-year old Kuranda Scenic Railway. Our journey takes us into the rainforest and above the Barron River Gorge to Kuranda. On arrival, we take a trip on a World War II amphibious military transport unit, or 'Army Duck', through World Heritage Rainforest, with the Duck Captain pointing out the different flora, fauna, birds and reptiles which we pass on our journey. After enjoying lunch, we experience Aboriginal 'corroboree' with songs and dance, following the path of the Dreamtime Walk through traditional legend. A real highlight of our tour is today's Quicksilver Cruise to the Great Barrier Reef, the world's largest coral reef system which is home to thousands of species and stretches over 1,800 miles. A large covered pontoon is our base for the day, where we enjoy lunch and explore the reef. Snorkelling is the best way to view the exquisite coral and vibrant fish close up, but our base also has a semi-submersible vessel to take non-swimmers for a cruise along the reef wall. The underwater observatory is a superb window into this extraordinary world! On Day 4 you are at leisure. We leave Cairns today and fly to the desert to Uluru. 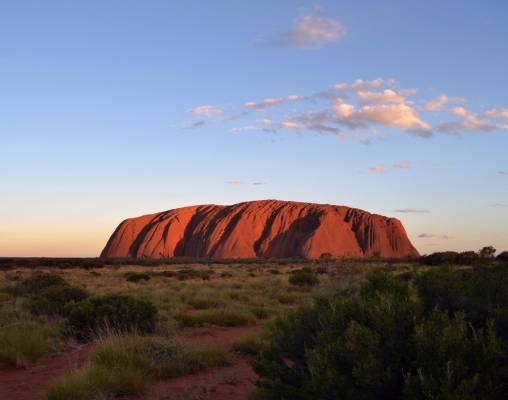 Ayers Rock, the world's largest monolith, rises majestically more than 1,142 feet out of the flat desert floor. We begin at the Aboriginal Cultural Center with a guided tour around this sacred site, which holds great spiritual significance to local Anangu people. Later, as the sun sets, we watch this giant rock change color and enjoy a magical dinner under the stars. The incredible 'Sounds of Silence' experience includes canapés and sparkling wine as the sun sets over Uluru, followed by a three-course dinner with a bush-inspired menu including kangaroo, crocodile, barramundi and quandong. After dinner, a 'star talker' will decode the southern night sky and point out signs of the zodiac and the planets and galaxies visible due to the clarity of the atmosphere. We spend two nights at the Desert Gardens Hotel in the Ayers Rock Resort. This morning we enjoy a 'Sunrise & Olgas' tour. This circular group of 36 red rocky domes cover a large area and are as mystical as Uluru. Your afternoon is free to spend at leisure in Ayers Rock Resort, an ideal opportunity to relax by the pool. Today we enjoy a free morning before traveling by coach to Alice Springs, for a night at the Doubletree by Hilton Hotel. On Day 8 we visit the Royal Flying Doctor Service and the School of the Air. We then join The Ghan for our epic rail journey traveling from Alice Springs to Adelaide. The Ghan has long been a tradition for train travel between Alice Springs and Adelaide and is often referred to as the ultimate journey through the heart of this mighty continent, taking passengers on what is undoubtedly one of the world's greatest rail journeys. Named after the Afghan drivers of the camel 'trains', The Ghan is a mode of transport, a sightseeing trip and a hotel all in one. We travel in Gold Service, with all of our meals included during the journey, which are served in the Restaurant Car. The meals are freshly prepared by the on-board chefs and menus feature a selection of Australian and international cuisine. Gold Service passengers also have access to the onboard Gold Lounge. All drinks for Gold Service passengers, including beers, wines and spirits, are included during your time on The Ghan. Once in Adelaide, we enjoy a city tour, seeing the Government House and Parliament Building. 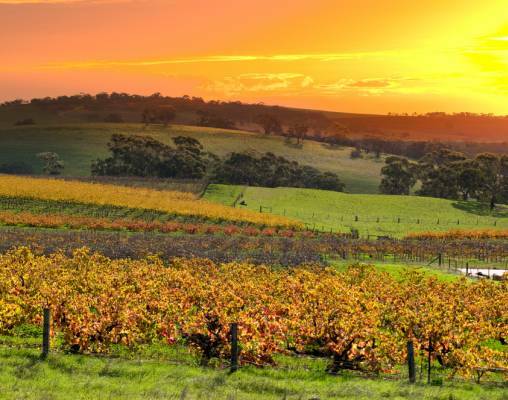 On Day 10, we explore the vineyards of the Barossa Valley on a full day tour, enjoying wine tastings on route. On Day 11 you are free to explore at leisure or take an optional excursion (payable locally) to Kangaroo Island. On Day 12 we leave Adelaide and journey to Melbourne, Australia's 'Garden State', on board The Overland. We check into Melbourne's Crown Promenade Hotel for a four-night stay. Our city tour today includes the Melbourne Cricket Ground and Parliament House. 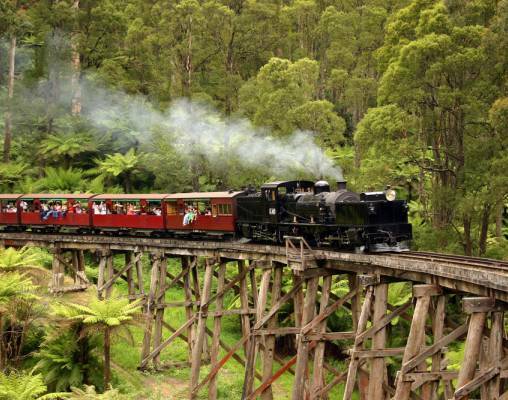 In the afternoon we join the Puffing Billy steam train for a journey through the rainforest and fern gullies of the Dandenong Ranges. 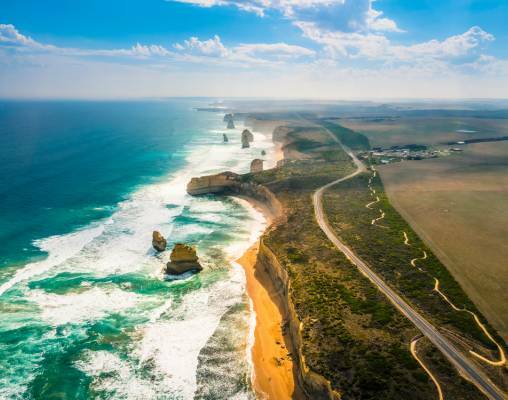 On Day 14 we travel along one of the world's most scenic roads, the Great Ocean Road, to the Twelve Apostles, Bells Beach and the Otway Rainforest. On Day 15 you are free until mid-afternoon, when we head by coach to Phillip Island, named after Governor Arthur Phillip, which forms a natural breakwater for the shallow waters of Western Port Bay. Here we visit the Koala Conservation Center. At sunset, overlooking the beach from the viewing platforms, you will encounter a wonderful spectacle of the wild fairy penguins emerging from the sea and crossing the sand to their burrows in the dunes (numbers vary depending on the season). We make our way to Sydney today. On Day 17 we enjoy a cruise around Sydney Harbor, seeing some of the most famous sights of Sydney, such as the iconic Opera House and the beautiful Harbor Bridge, from our boat. The rest of the day is at leisure to continue exploring Sydney at your own pace. 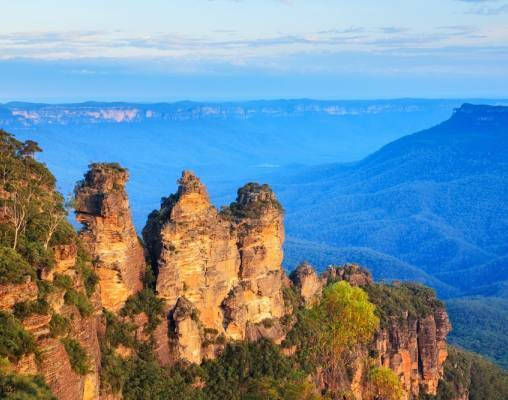 On Day 18 we take the train into the Blue Mountains, enjoying a journey on the world's steepest incline railroad, the Katoomba Scenic Railroad. We also visit the iconic Three Sisters Rock Formation in Echo Point. Day 19 is free in Sydney. You make your way to the aiport for your flight back home. The 4-Star Majestic Roof Garden Hotel is located in the center of Adelaide, providing easy access to many of the city's main attractions. The hotel boasts a lobby restaurant and bar overlooking the streets of Adelaide, which is open daily for breakfast and dinner. Leisure facilities include a fitness center offering views over the whole city. All hotel rooms come equipped with mini bar, air conditioning, complimentary Wi-Fi internet access, safe, television, iron and ironing board, and tea and coffee making facilities. The 4-Star Desert Gardens Hotel enjoys a central location in Ayers Rock Resort, close to all the resort's facilities as well as the lookouts, where you can enjoy watching the sunset on Uluru and the surrounding desert. The hotel is set amidst gardens of ghost gums and native flowering shrubs and features a restaurant serving Australian cuisine, a bar and an outdoor pool. All rooms are air conditioned and equipped with a telephone, television, radio, mini-bar, refrigerator, tea and coffee making facilities and a hairdryer. All rooms have either a private veranda or courtyard. Found in the heart of Cairns City, the city of the Great Barrier Reef of Australia, the Pullman Cairns International Hotel is an excellent choice from which to explore more of Australia and this metropolitan city. The hotel features a superb range of amenities including a swimming pool, a Jacuzzi, a gymnasium and a sauna. There is also a bar and a restaurant. Each room has a hairdryer, a minibar and a television. The 4-star Crown Promenade is situated in the heart of Melbourne's lively Southbank district. A range of restaurants, bars and cafés serve food and drinks in the attached Entertainment Complex, and the hotel also has its own restaurant and bar on site. 24-hour room service is available. Rooms at the Crown Promenade assure air conditioning with independent temperate control, a large flat-panel digital television, mini-bar, tea and coffee making facilities, hair dryer, safe and high-speed wireless internet access. Relaxing is easy at the hotel's Deck leisure center, which features a 25 metre indoor pool, a sauna, steam and massage rooms, a gym and an activities studio. 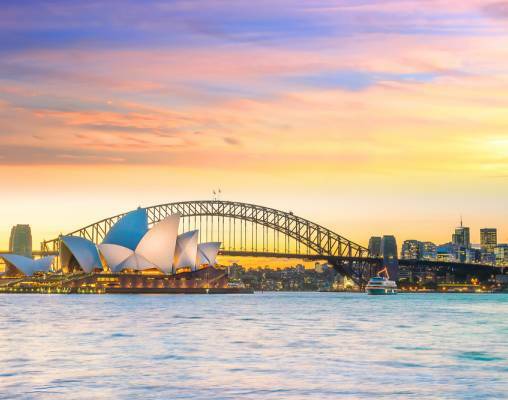 The 5-Star Amora Hotel Jamison is located in the center of the city near just a short walk away from the Sydney Opera House, Harbor Bridge and many more of Sydney's great attractions. The hotel boasts two restaurants and two bars for you to choose from, offering a wide range of food for you to enjoy. Leisure facilities at the Amora Hotel Jamison include a heated swimming pool, fully equipped gym, sauna, steam room and the Amora spa (payable locally). The contemporary hotel rooms come equipped with air conditioning, mini bar, hairdryer, safe, toaster, telephone, iron and ironing board and television. Once a 19th century novelty that pre-dated rollercoasters, the Katoomba Scenic Railroad is the world's steepest incline track. The railroad gradually lowers through the ancient rainforest surroundings. The Kuranda Scenic Railroad has journeyed through the World Heritage Rainforest of tropical North Queensland for 125 years. Weaving through a series of switchbacks and tunnels above the Barron River Gorge to Kuranda, the KSRprovides magnificent views of this outstanding national park. The frequent NSW TrainLink XPT service operates in and between several Australian cities, including Brisbane, Sydney, Melbourne and Casino. Similar in design to the UK's InterCity 125, the XPT follows the route of the Hume Highway through the state of Victoria, passing through Benalla and the cathedral city of Wangaratta before entering the state of New South Wales and the Riverina region. The broad, flat plains of the Riverina comprise some of the most agriculturally productive land in Australia due to the favourable climate and a plentiful water supply. The XPT service continues through the cities of Albury and Wagga Wagga and then heads west to Cootamundra and the Southern Tablelands. Leaving Goulburn, the train enters the Southern Highlands of New South Wales, a mountainous wine-producing region that sits on the Great Dividing Range. Finally, after passing through the suburbs of Campbelltown and Strathfield in the Australian capital, the service pulls into Sydney's Central Railroad Station. We reserve First Class carriages for daytime journeys on the NSW TrainLink XPT. First Class accommodation features extra legroom, a deluxe reclining seat, and a footrest. Most seats rotate to form a 'conversation group' of four. A buffet car selling a selection of hot and cold meals, snacks, alcoholic and non-alcoholic drinks are available on board the train. With its reputation as Australia's favourite steam train the century-old Puffing Billy is a treasure for rail enthusiasts. A low-cost narrow gauge line constructed in Victoria during the early 1900s, the classic steam engine opened up rural areas and has been championed by the Puffing Billy Preservation Society since the sixties. We journey on Billy from Belgrave through the Dandenong Ranges, crossing rustic timber bridges and passing scenic Emerald Lake Park and Wright State Forest on the way to the historic town of Gembrook. 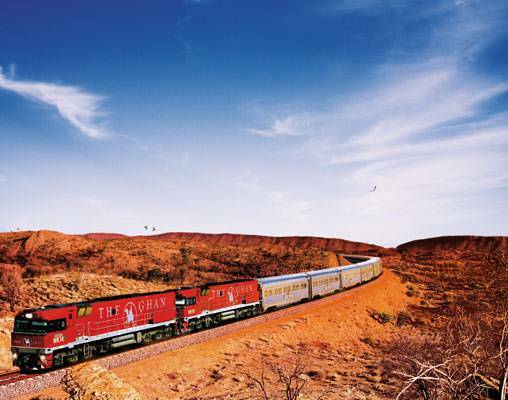 Australia's Afghan Express, now affectionately referred to as The Ghan, offers Great Rail Journeys' guests an epic travel experience through this remarkable country. Named in tribute to the Afghan camel drivers who helped to make Australia's arid and uncharted Red Center accessible at the end of the nineteenth century, The Ghan's maiden journey in August 1929 traveled the 1,559 kilometres from Adelaide, South Australia to Alice Springs. Since that first journey it was always intended that The Ghan's journey would continue from Alice Springs to Darwin on the coast of Australia's Northern Territory, and this became a reality in 2004 following the opening of a 1,420-kilometre rail link between the two cities. Today, the entire 2,979-kilometre trip from Adelaide to Darwin, or vice-versa, can be made in three days. Traveling in luxurious comfort aboard a train fully-equipped with modern amenities, our guests aboard The Ghan enjoy a journey that takes in some of Australia's most diverse and spectacular scenery. The recently refurbished Overland serves the route between Adelaide and Melbourne. During this daylight journey we travel in Red Premium Service, which offers passengers comfortable reclining seats and complimentary orange juice or water on boarding the train. Red Premium Service passengers have access to the licensed Red Service Café Carriage which serves a selection of snacks, meals and drinks. There is also an at-seat trolley service with snacks and drinks available for purchase, as well as a limited selection of a la carte dishes. Enter your details below if you would like to be notified when 2021 dates and prices are available for Australia & The Ghan. Prices are correct at the time of publication, however are subject to change at time of booking. Hotel and Rail accommodations listed above, are subject to change based on availability at the time of booking. Prices are land-only per person based on double occupancy. Itinerary and accommodations may vary for 2020 departures, please speak with a rail specialist for details.